Pick up at Ritual, please! I’ve been looking for GFCF bread here.Are the bread Western or Asian style? The reason I ask is I find most bread in Asia sweet. Do you have gluten free baguettes? Thanks. I ordered them from edgy veggie last week. So good to finally enjoy my peanut butter after being bread-free for so long. Looking forward to your GFCF class. Also curious to know if you teach GFCF baking. Not yet but one of these days I’d love to! Hi, Marie. Yesterday I picked up my first couple GF loaves at Corner Tree Cafe. I am SO grateful to find good quality, locally made GF bread in Manila. I was diagnosed with celiac five years ago and eating GF in this city is daunting. I have a couple of questions: 1) is it possible to order your GF bread unfrozen, and 2) will you be expanding your GF offerings? GF pan de sal would be lovely, I miss it so much 🙂 Thank you for all that you do, and keep up the good work! Glad you’re enjoying the bread! Yes bread is available frozen. If you picked up bread yesterday it was delivered last Friday. If you want fresh loaves, you have 2 options: 1. through Edgy Veggy Cafe in Kapitolyo (they deliver in Makati / Ortigas / Fort too) or 2. directly through me although I am based in Alabang. As for other GF offerings, I do sell GF chocolate chip cookies and gingersnap cookies. My ice cream line is completely dairy free and gluten free. I have a GF chocolate chip cookie ice cream and GF gingersnap ice cream. For scoops check out Ritual in Malugay, Makati, Corner Tree Cafe, and Edgy Veggy. Edgy Veggy carries my ice cream in pints as well. I’m hoping to produce different kinds of GF bread for sure. Pan de sal is in the horizon. I currently do baguettes, through Edgy Veggy and through me. Ciabatta perhaps. Sometimes I do GF cakes when I get special orders. Feel free to send me an email or text! Check my contact page for details. Marie, that all sounds wonderful. I’ll try the baguettes next time, and the choc chip cookies and ice cream! Looking forward to the pan de sal, too. The cookies are dairy free and egg free. Completely vegan. The bread is made with brown rice, by the way. Please send me an SMS (0917-894-5086) or email. Am baking bread today so text me so I can send you my address. Thanks! Good morning Marie, may I know your Alabang address? We want to buy gluten-free loaves and cookies for my son. Good morning. May I know your Alabang address? We’ll be buying your loaves and cookies for my son. Sorry but I just read your message now! Please send me a text (check my ‘contact’ page) so I can send you my address directly. I bake to order, by the way. So you’d have to let me know a few days beforehand. Omg! Been looking for gluten free bread all weekend. I’m so happy I found you. Any chance you’ll have deliveries in makati this week? Please send me a text! Check my ‘contact’ page for info. I’m delivering to Makati on Wednesday (tomorrow) and possibly Friday. A loaf / baguette is P130. Alternatively you can purchase from Corner Tree Cafe. My son has wheat allergy which is really sad because he loves bread and pastries. So i’ve been on a wheat / gluten free food hunt ever since we found out. When I saw this, I immediately placed my order with edgy veggy which is near my place. This is really nice because now he can have his bread and cookies without fear of allergic reactions. Anyway, would you be venturing to other gluten-free stuffs like cakes and pastries? If so please keep us posted. Thanks. Glad your wheat-allergic son can still have his bread! I’m currently testing gluten-free sandwich bread. Dinner rolls in the future. Right now I’ve got round loaves, baguettes, and focaccia on sale. Edgy Veggy doesn’t stock up on focaccia though so you’d have to place an order through them for this. Yes am definitely experimenting with other gluten-free goods like cake and cupcakes. I currently make dairy free, gluten free ice cream with flavors like fudge brownie, chocolate chip cookie, and gingersnap cookie. I haven’t advertised on my blog but I occasionally post on Facebook about the ice cream. Send me your email address, I can send you a complete list of of my ice cream! Edgy Veggy orders pints regularly and they serve the ice cream in the cafe as well. I just found out that Im allergic to goods with gluten… It’s so hard not to find anything that is gluten free. I live in the Fort and Im new to Manila. Can I get food and bread delivered? Is Kitchenrevolution and Edgy Veggy the same? Can I order bread from either one? I have so many questions is there another email I can ask all my questions? Please email me info@kitchenrevolution.ph . Edgy Veggy and Kitchen Revolution are separate entities. You can order bread from Edgy Veggy, who also does prepared veggie food. Do you sell gluten free bread in Alabang area as well? Not sure if I replied to you – yes I do! Please contact me directly for the pick up point. I bake free to order. I have been looking online to find gluten free options in the Philippines as I will be travelling there next week. My hometown is Cagayan de Oro. Do yoj have any products that can be delivered? I don’t deliver gluten-free bread to CDO because they need to be refrigerated. I haven’t been able to find a solution to shipping my bread refrigerated. May i know ur address and number? I love to order bread and ice cream.. 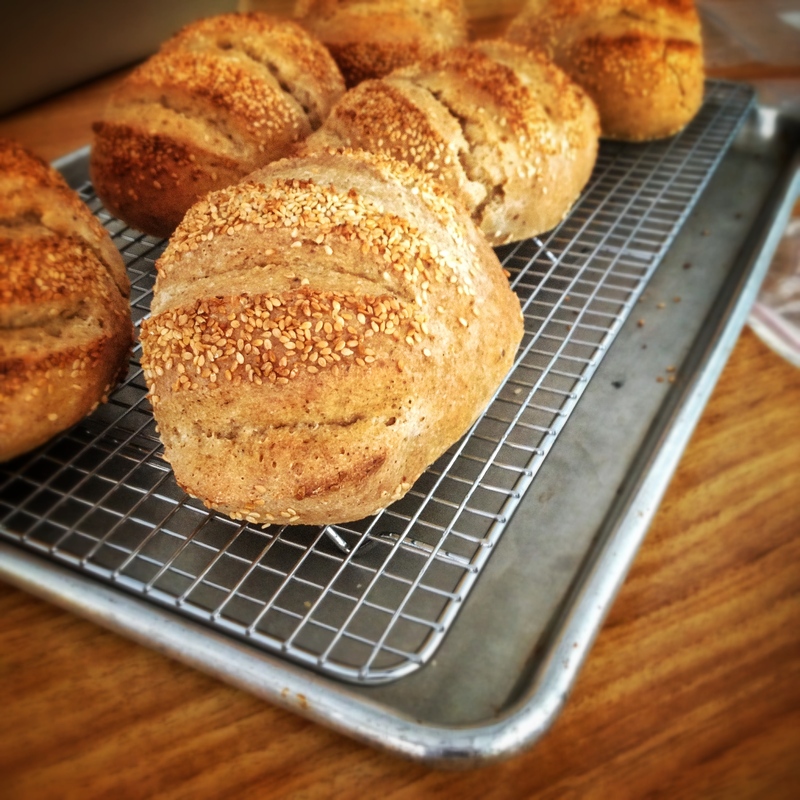 When are you going to make gfcf bread? Very much interested in ordering GF bread,do you do pick ups at the Fort? Hi! I ordered 3 oval loaves from edgy veggy yesterday, is it okay to store them in a freezer? How long do I need to bake them? Thanks! Hi, sorry for my late reply! Just got back from travels. Anyway, the bread is baked and no need to rebake! You can definitely store in the freezer, but slice first before you do so you can just toast as needed. Definitely toast the bread before you eat it. Don’t eat cold bread, you won’t enjoy it. Don’t try slicing frozen bread, it will crumble and you will be sad! Hi Shamsi, please check out Corner Tree Cafe – they carry my round loaves. Holy Carabao and Edgy Veggy delivers my bread as well. I’d like a Makati pick up point for the gluten free bread. Pls advise. Hi, Corner Tree Cafe on Jupiter St carries my round loaves. Please email me directly if you’d like to order other kinds – info@kitchenrevolution.ph Thanks. How long does the bread keep in the ref after it’s been defrosted? Thanks! Hi Aileen, sorry I don’t deliver bread to Davao as it needs to be chilled. If you are in Manila let me know! Hi, do you a shop in other places/provinces? Hi Susan, sorry I don’t have shops outside of Manila. If you’re interested in my gluten-free cookies I can ship those out around the country by courier no problem. The breads are trickier as they need to be shipped refrigerated / frozen. I’ve never attempted shipping them out. 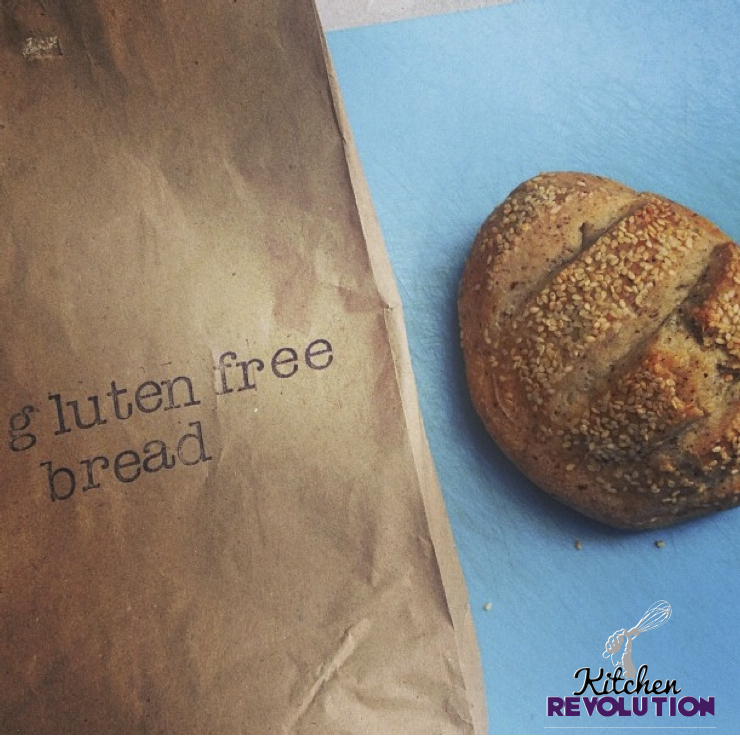 where can we buy and pick up gluten free bread in alabang? where is kitchen revolution? Hi sorry for my late reply, I just saw your message. Please send me a text or email if you’d like to pick up from Alabang – I bake from home! I don’t publish my address because it is a residential one. Hi, as of now no! I’m looking into a courier that can ship my bread as it needs to be chilled at all times. For now, you can check out gerald.ph or Holy Carabao – they deliver!